Starting Version 5.3.0, Users will be able to search content via a Slack App. However, the scope of their ability to find data in Metric Insights is determined by their Group membership and Security settings. NOTE: Typically only Admins have the capacity to configure Group access and modify the Slack App settings. 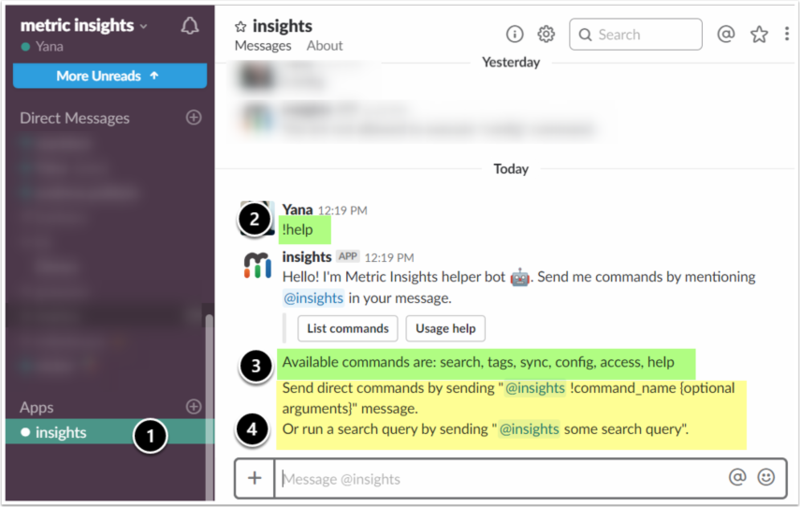 Slack App management commands are accessible via Direct Messaging. Choose MI Slack App for Direct Messaging. Type !help command to obtain more information. Click [List commands] to see options. Optionally, click [Usage help] for instructions on how to run commands. Assigning User access and changing Slack App settings can only be done through Direct Messaging with the Slack App. 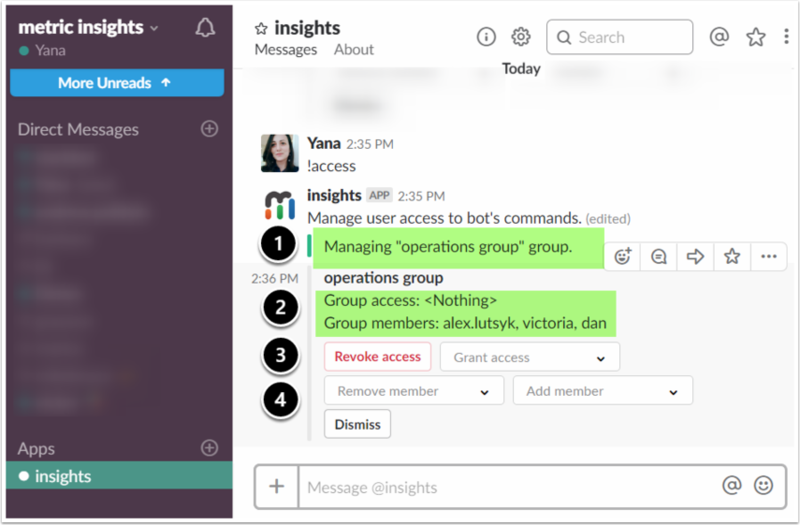 Management commands are not available in a Slack Channel. 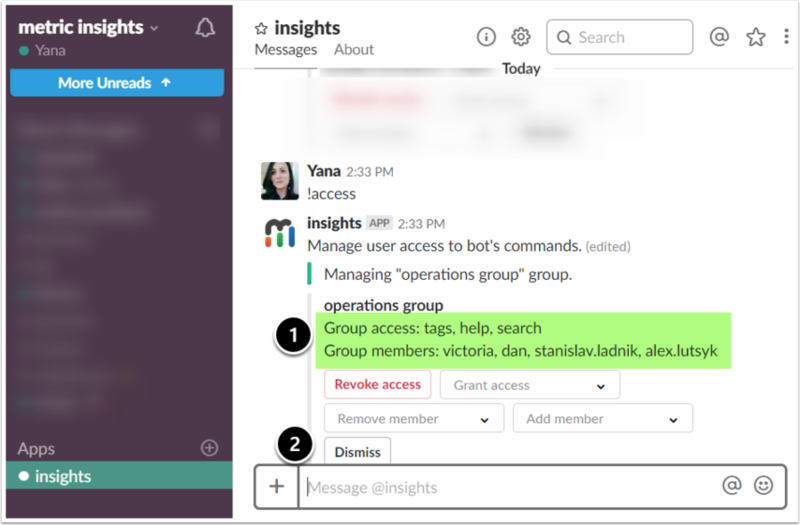 From the dropdown, Select a Slack group to manage or Create a new Group. Manage channels available for the Bot: verify and configure Channels that the Slack App will be able to access. 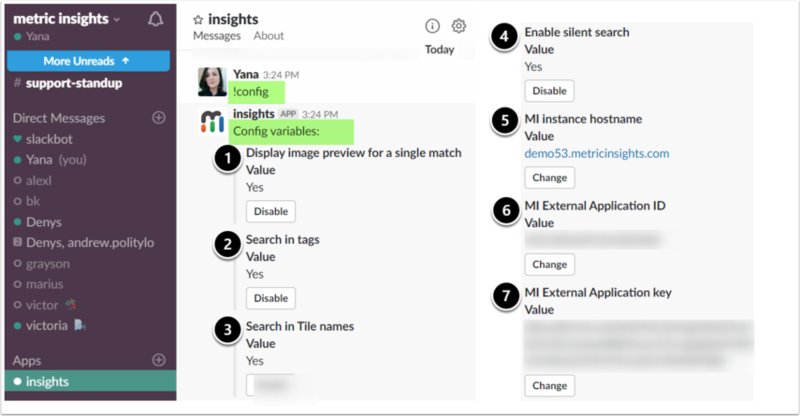 Groups in Slack do not correlate with Groups in Metric Insights and have to be set up separately. The Slack App displays the Group you are managing. Verify the Group members and access settings. Click [Grant access] to allow access to ALL or specific commands. Alternatively, click [Revoke access] to withdraw access from the Group. Click [Add members] to include other members in the Group. Alternatively, click [Remove member] to exclude selected member(s) from the Group. Changes that are made to access settings will immediately be displayed in the Group information section. Click [Dismiss] to stop managing the Group. Display image preview for a single match: an image preview will be displayed if there is only one element satisfying the search criteria. Search in tags: enables search by elements' Tags. Search in Tile names: activates search by the names of elements. Enable silent search: allows to formulate queries without directly addressing the Slack App in the Channel. MI instance hostname: specifies the instance where the Slack App will be searching for matching elements. MI External Application ID: access ID generated in Metric Insights when a new External Application is added to the system; allows the Slack App to access the MI Instance. MI External Application key: secret access key generated in Metric Insights when a new External Application is added to the system; allows the Slack App to access the MI Instance. MI user name, associated with the bot: this Metric Insights User determines to which content the Slack App has access. Dataset ID to fetch tile info from: determines the Dataset ID containing metadata about elements. Enable NLU webservice search: if activated, the Slack App can parse queries formulated as natural language sentences, if disabled the Slack App will use simple search. Display debug messages: activates the display of debug messages containing NLU extracted entities (used to check how the search query was parsed). Slackbot instance hostname: indicates the Instance where the Slack App is deployed.